A clever, games based app that encourages users to create their own number equations using the four operations: addition; subtraction; multiplication and division. Although it takes some experimenting to understand the game play itself, once users are comfortable with this, they are able to play unhinged and the app allows the natural development of their own mathematical understanding. The creative element of this game allows the app to be extended to a range of users from beginners to expert. This imaginative game allows users to create their own questions using the four operations: addition; subtraction; multiplication and division. 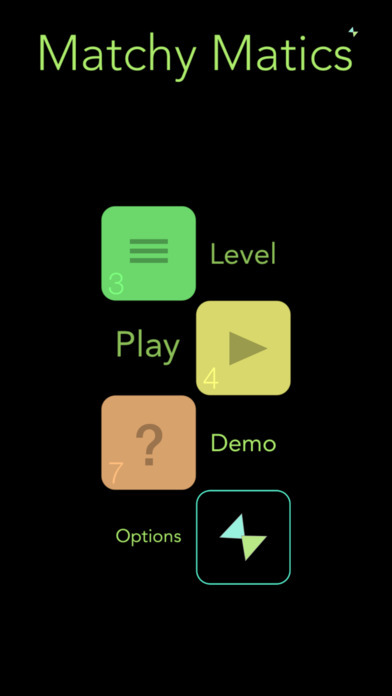 Upon opening the app, users are presented with four options: the first, represented by three lines, links to an overview of all the levels available to the user; the second, a play button, takes users to the actual game play area; the third, a question mark, presents an image of the game being played; while the fourth, a twisted timer symbol, links to the settings page. Upon beginning, users can either jump straight into the game where instructions explain how to play, or alternatively a natural starting point is the video area, which offers users a visual overview of the game. 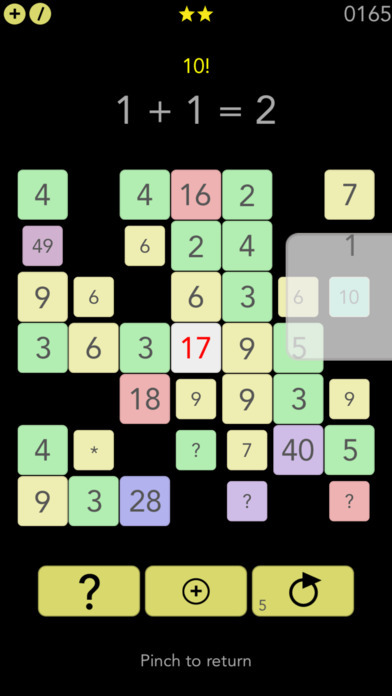 In terms of the game itself, the screen is set out on a 7 by 7 or 5 by 5 grid, made up from random numbers. Above the grid, users are presented with an equation which totals the number in the centre of the grid, while the button at the bottom allows students to change the operation between addition, subtraction, multiplication or divide. Users must then drag one number from the gird and drop it on to another number on the grid, using the desired operation, to form an equation totalling the number in the centre. 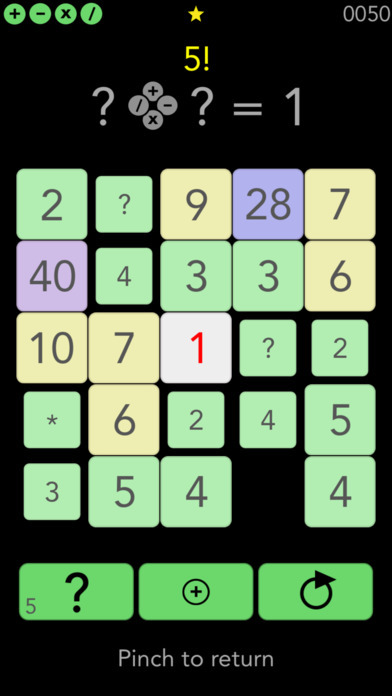 When a number has been used once, the tile shrinks in size and either becomes a different number or a number represented as a question mark. 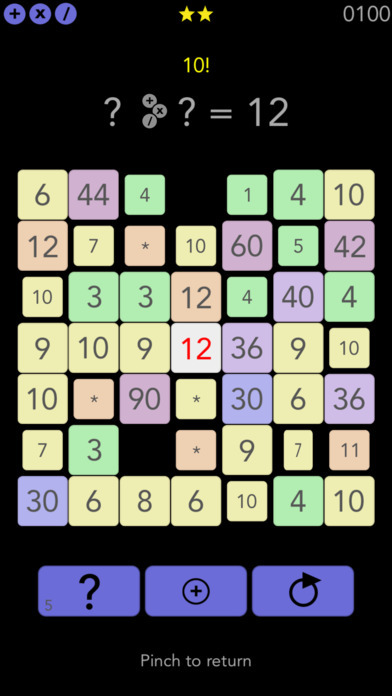 Each tile needs to have been used twice before it disappears, with the aim of the game being to remove all the tiles, by solving a variety of equations. Users can also receive limited support within the game by changing the centre figure when they feel they cannot create a specific total. This style of support makes the game accessible to a range of audiences, from those first encountering number operations, to those looking to speed up and extend their mathematical understanding. After several games and once users have understood the basic concept, they begin to think about strategy. At this point, it might be useful to return to the video area to pick up further tips and ideas. At certain points in the game, there is only one solution, and this solution will naturally develop children’s abilities and therefore extend their learning. This ability to create questions is perhaps the greatest aspect of the game. Returning to the homepage, the options button allows users to mute the sound within the game or the background music. While, the level page outlines all the available games to play. Each game tests a different skill, beginning with the ability to use all four operations, then gradually reducing the operation used making the game play more difficult as children focus on specific skills. Overall, the app is an excellent creative resource for use in the classroom or at home, which after some initial learning, allows for continued development of mathematical skills. Worthy of a four-star rating. *Now certified by the UK based educational app portal - educationalappstore.com. Matchy Matics is a fun, simple number puzzle game with an educational twist. The idea is to clear the numbered blocks by finding number combinations (add, subtract, multiply and divide) that equal the red target block, and in doing so earn a medal. Wheres the rub? Is there a rub? Of course - you are free to find the target with any valid combination for that level. Choice can introduce some variation, watch out for those unexpected numbers, the so-called black swans! The educational twist is while you solve the puzzle you're practicing some mental arithmetic, cool eh? 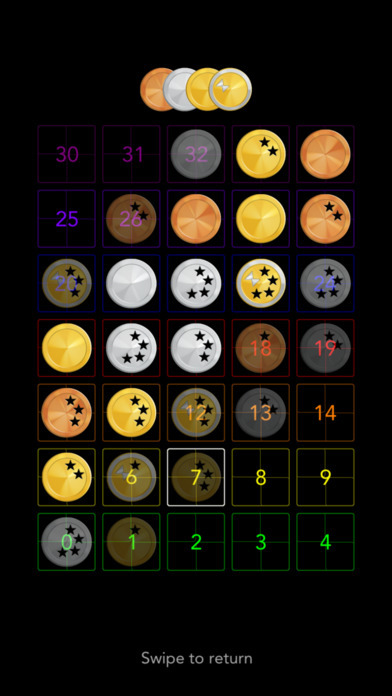 There are 35 randomly generated levels that can be re-played to improve your best medal. Each time the combinations and numbers will be different. If you don't like a particular level restart for something better. On the level screen you can see your overall progress and best medal to date. The philosophy behind the game was to create something both thought provoking and forgiving, theres no time limit and there are tools to help : the tap-calculator, help and shuffle buttons. The blocks are colour coded. Theres also a self-play mode to show you what to do, or simply if you like the entertainment of watching something else (i.e. the app) complete the puzzle! There is something here for everybody, something for those who love numbers and puzzles, something for those who want to brush-up, something for younger people who need to learn more about numbers and something for those who want to spend a few minutes exercising their mind. Even if you feel adverse to numbers, why not give it a try, its a gentle start, you never know.